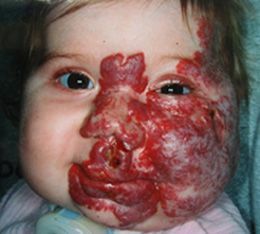 Infantile hemangiomas are the most common birthmark of infancy. They are benign (not a cancer) stem cell tumors with no genetic or causative factor. 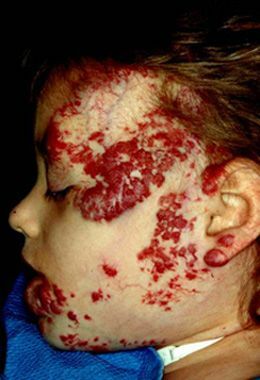 Hemangiomas occur in infants only; they never develop in adults. While not well understood, hemangiomas affect girls three to five times more often than boys. Other associated risk factors include prematurity, low birth weight, and twin pregnancy. 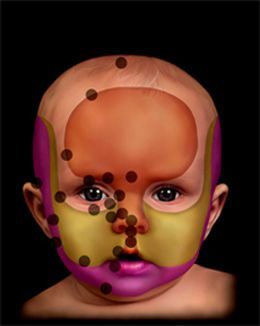 While hemangiomas can appear anywhere on the body, more than 80% involve the head and neck, including areas around the forehead, eyes, tip of the nose, cheek, and lips. Recent evidence suggests that hemangiomas are stem cell tumors. They are however benign in their behavior. They grow for a finite period of time and do not spread to other tissues. Most are quite small and innocuous but some can be quite large. At present, there are no known statistics as to what percentage will be problematic. These are the most common and grow as solitary tumors. They typically grow rapidly in the first few weeks of life and then the growth rate slows. Most of the growth is done by the age of 6 – 7 months. Focal hemangiomas grow in specific sites, known as sites of predilection. They are commonly found in skin or just beneath it. They can also grow in the parotid salivary gland or the breast bud. Focal hemangiomas can be entirely superficial, in which case they are a reddish color, or deep in which case the lesion is a bluish color, or compound, with both superficial and deep components. As their name implies, segmental hemangiomas grow to involve one or more segments of the face and body. This relates to the development of the fetus which takes place segmentally. Their involvement is thus more widespread. Segmental hemangiomas behave differently with a different growth pattern. They also grow rapidly in the first few weeks of life, but they can continue to grow for much longer periods of time. It is not unusual for a segmental hemangioma to grow for up to 2 years. These hemangiomas ulcerate more frequently and can be locally more destructive. In about 30% of cases, there are other associated developmental abnormalities. These are collectively known as PHACES syndrome. Each of the letters in this syndrome stands for a developmental abnormality. It is important to note that it is uncommon for all of these abnormalities to be present in any one child. Most children with this syndrome will have 2 or 3 of these abnormalities. It is however imperative that all children with a segmental hemangioma be investigated for PHACES syndrome. 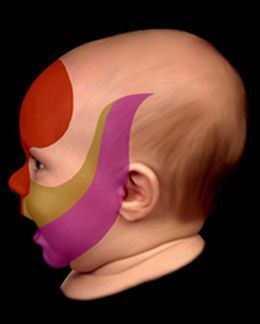 Up to 30% of children with segmental hemangiomas may have PHACES syndrome. Most hemangiomas are quite benign and do not cause any complications. A brief description of the possible complications will follow. This is the most frequent complication. 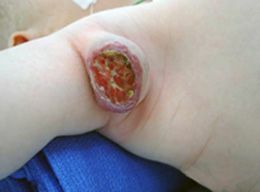 Ulceration can occur in children with focal and segmental hemangiomas. Ulceration occurs more often in segmental hemangiomas and according to our research, is seen in up to 30% of these types of hemangiomas. A small number of focal hemangiomas will ulcerate. Ulceration means loss of the overlying skin. We are not exactly sure why this happens but we do know that it is painful and may persist for many weeks or even months. In general, ulceration is extremely painful and the degree of pain seems to be out of proportion to the degree of ulceration. This is difficult to prove since infants cannot vocalize their complaints. Ulceration usually appears early and may persist for several months. Apart from the severe pain, ulcerated hemangiomas can bleed spontaneously and rarely, this may be severe. It is important for the parents and the physician to realize that children with ulcerative hemangiomas are in chronic pain and everything should be done to minimize this. There is unfortunately, no reliable and effective way of treating ulcerated hemangiomas. Recent experience with propranolol has been encouraging but we cannot categorically state that this is effective at this stage. In these cases, surgery may be a first line option. The cornea of the eye is partly responsible for focusing an object on the retina of the eye in one plane. If an hemangioma applies any pressure on the eyeball, this can deform the cornea and affect its focusing mechanism. This will result in what is known as astigmatism. Astigmatism will affect the focusing mechanism and the eye will perceive an unfocused, ‘fuzzy’ image. While this will not be much of a problem to an adult, a child’s optic tract is immature and develops fully sometime after birth. If one eye is normal and the other has astigmatism, the brain will ‘ignore’ the abnormal side and a ‘lazy’ eye will develop. This is a blind or partially blind eye and is known as amblyopia. Apart from astigmatism, a hemangioma that obstructs the visual axis will also cause amblyopia. 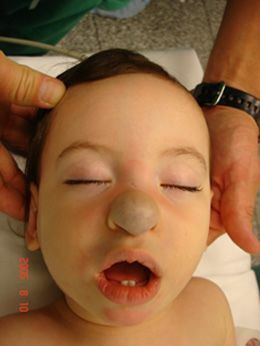 Hemangiomas are capable of growing in the airway. They may do so as part of a segmental hemangioma or alone as a focal hemangioma. Any child with a ‘beard’ distribution (lower cheek, chin, lower lip) segmental hemangioma should be examined for this by an ear, nose and throat surgeon and if it is present, monitored closely. A focal hemangioma, may have no outward sign that indicates its presence. The first sign of an hemangioma is stridor. Stridor is noisy breathing that results from a partial obstruction. If noisy breathing persists and is not due to secretions in the back of the throat, take your child to a physician. This is urgent. Although this has not been well documented, we have seen several children with a large focal hemangioma or extensive focal hemangiomas, fail to thrive. Since the hemangioma is a tumor, it is not difficult to see why this happens. In simple terms, the hemangioma competes with the infant for nutrients and sometimes, there is not enough for both infant and child. The child will slow down his/her weight gain and can even stop gaining weight. A large focal hemangioma or an extensive segmental hemangioma can affect the blood circulation to such an extent that the heart is forced to enlarge to compensate for this. There is however a limit to this and once the heart has reached its limit and is no longer able to enlarge, the heart will fail to fulfill its function and the child will present with heart failure. Once again, this can be prevented and treated; left untreated, this can be fatal. Heart failure can also be seen if there is extensive liver involvement. If a child presents with several skin hemangiomas (usually five or more), the child should undergo an abdominal ultrasound to see whether or not there are liver or ‘internal’ hemangiomas. Eventually all hemangiomas stop growing and begin to involute (shrink). Each hemangioma will do this at its own pace. Some involute rapidly (over 2 to three years whereas others may take up to 12 years to involute. It is important to understand that the end point of involution can be quite variable. Some will involute and leave barely a trace, whereas others will hardly shrink at all. By about 2 to 3 years of age, it should be possible to determine whether or not your child’s hemangioma is shrinking rapidly or not. Rapidly involuting hemangiomas usually leave little trace of their presence at the end of this process. On the other hand, slow involuters are more likely to leave a significant residuum. This may take many forms, all of which require treatment: atrophic scarring of the skin, scarring with a fibrofatty mass, fibrofatty mass. Atrophic scarring (thin, whiter, inelastic skin) is most frequent. Normal skin, especially that of a young child, has an abundance of collagen and elastin in the dermis. This is what makes a child’s skin thick and supple, as compared with that of a mature adult. During the process of aging, we lose some collagen as well as elastin and this is in part, what is responsible for the aging process of skin. A superficial hemangioma that involves skin, will replace the dermis where the collagen and elastin is contained. As the hemangioma involutes, this layer is not replaced and the end result is thin ‘aged’ or atrophic skin. Often, some of the dilated blood vessels will remain and these will be evident as telangiectasias (broken capillaries). Residual Mass. About half of all focal hemangiomas will leave a residual mass of what is known as fibrofatty tissue at the end of involution. This usually takes the form of a soft doughy mass. If the overlying skin was involved, residual telangiectasias (broken capillaries) and atrophic scarring may be left behind. Hypertrophic scarring. Whenever a hemangioma has ulcerated, it will always leave a residual scar behind. This will either be an atrophic (thin) scar or a hypertrophic (thick scar). It will almost never leave normal skin behind. The timing of treatment is an important issue. There are no hard and fast rules and unfortunately, the timing is often dictated by the beliefs of the physician. It is important to realize that the early years of a child’s life are the formative years of his/her psychological development. Clearly, disfigurement can adversely affect this. For this reason, we believe that early intervention is warranted. This must however be carefully weighed against the likelihood of complete involution (regression) of the hemangioma. Furthermore, the result of early intervention should leave a result that is as good as or better than the result of natural involution. This is clearly a difficult decision that should not be taken lightly. We advise the parents of the child to seek professional help and this should be given by several physicians. Unfortunately, this can be confusing since opinions will vary. Remember, these are only opinions, and nothing more. Complications such as ulceration, congestive heart failure and failure to thrive clearly warrant early intervention. An hemangioma that interferes with a function such as speech or feeding should be treated early. The same applies to an hemangioma that could potentially block the child’s airway.